Last week, my gal pals and I got together for our annual Christmas shindig at my friend Deb's house. We ate, we drank sodas and coffee and we generally got Merry! We exchanged gifts and we made cards. 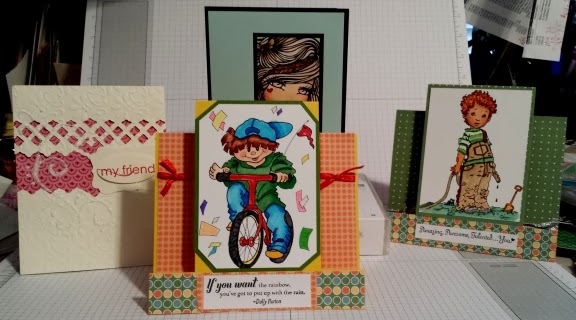 Below are the cards I made that day. #1 Is a Christmas card I made for Deb. It was a lovely flat dsp. 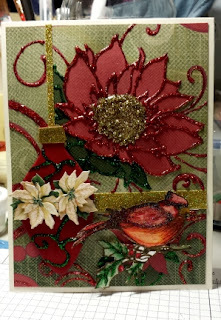 But add some stickles and some glittery stickers and a hand stamped and hand colored red bird and it just takes on that "Christmas" spirit! #2 is a Christmas card I made for my friend Lorna. Island Indigo has long been a favorite color cs for me. 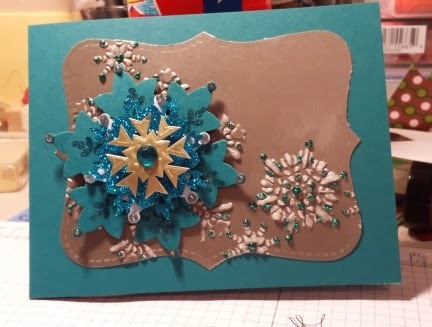 Mix it with silver, a snowflake embossing folder, a blingy snowflake sticker and some stickles and voila! a wintery Christmas card! #3 is a mishmash of cards I made that day. The reindeer and Santa cards were my own creations. The Snowman and the ornament were designed by Lorna and the 3 little mice was designed by Deb. #4 Is another mishmash of cards. The cream and pink card was designed by me. 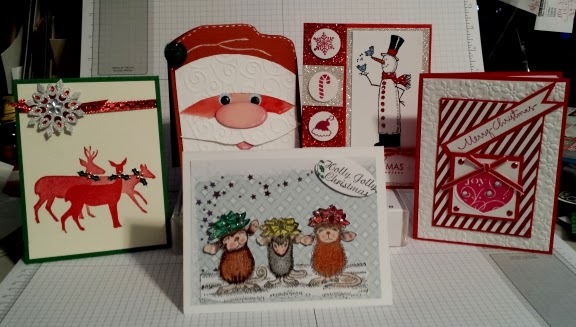 The other 3 are designed by my other friend Debbie A. That was such a F U N day! We laughed and enjoyed each others company and shared our own Christmas spirit with one another. 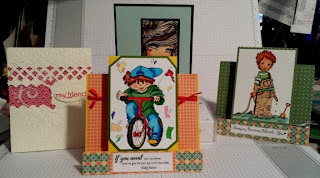 Awesome cards, dearie!! Merry Christmas to you and your family! !